In our last article, we discussed what proactive steps you can take to reduce your risk of developing dementia and Alzheimer’s disease. Today we’re going to go into further detail on one such step: regular exercise. Many older adults find that with age fitness is more difficult to maintain. 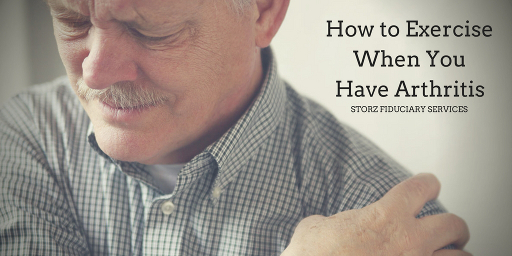 You may face chronic pain, fatigue, or illnesses that limit your physical abilities. Additionally, if you’re isolated from friends and family you might lack the motivation to exercise on your own. There’s still plenty you can do, however! Let’s learn why exercise plays such an important role in reducing one’s risk for these serious diseases, and how you can incorporate it into your own life. What scientific evidence is there to support this claim? As one reference, we can look at a study done by neuroscientist Art Kramer. He scanned the brains of 120 older adults, half of whom started a program of moderate aerobic exercise — just 45 minutes, three days a week, mostly walking. After a year, the MRI scans showed that for the aerobic group, the volume of their brains actually increased. What’s more, individuals in the control group lost about 1.5 percent of their brain volume, adding up to a 3.5 percent difference between individuals who took part in aerobic exercise and those who did not. Further tests showed that increased brain volume translated into better memory. This isn’t an isolated case. Bryan James is an epidemiologist at the Rush Alzheimer’s Disease Center in Chicago. He conducted a study in which he looked at a different measure of activity — something he calls “life space.” He added up how often people got out of their bedroom, went out of their house, traveled out of their neighborhood or out of town. “The people who never left their home — even though they didn’t seem to have any cognitive problems when we started following them — were twice as likely to develop Alzheimer’s disease over five years,” James says. Why exactly does this happen? Increased aerobic capacity has benefits for the metabolism and physiological function of the brain. A protein known as brain-derived neurotropic factor (BDNF) is known to be important in the development, survival, and plasticity of nerve cells called neurons. It’s also important in protecting against neuro-degeneration that’s associated with Alzheimer’s disease, and other forms of dementia. Regular aerobic exercise boosts the level of BDNF by 2-3 times, and clearly the more often you exercise, the more prolonged the effect. We all deal with stress and fear in our everyday life, requiring our brains to constantly adapt. 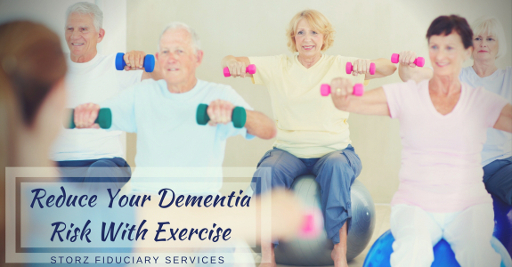 Since exercise has been shown to help us do this, it may well explain how it can be effective in reducing the risk of depression, anxiety, and dementia. As mentioned, this blog has covered the topic of fitness in the past. There are 3 common threads among them: start with easy, gentle exercises until you know your personal limits; reach out to family and friends for support, or look for a group to join; and have fun! By finding activities you really enjoy doing, you ensure that you continue to do them with regularity. Does this mean that you can 100% prevent dementia? Sadly, no. There are a myriad of factors that influence someone’s risk. However, you can play an active role in your own future health, and do a great deal of good for your brain! This is part of a continuing series on how seniors can stay fit long into their older years. Arthritis is extremely common among the elderly, and can affect life negatively in numerous ways. If you’re a sufferer, you might wonder how you could possibly exercise with the pain you experience. However, you can take an active role in protecting your joints so that you can enjoy a pain-free life. Many people with arthritis mistakenly believe they should avoid exercise and rest their muscles and joints. Inactivity and a sedentary lifestyle weaken cartilage and bone, and increase the likelihood of damage and deterioration. A person with arthritis (regardless of age or gender) needs to exercise for the same reasons as everyone else: to maintain skeletal muscle, heart health, and bone density. They also need to increase strength, flexibility, and range of motion. So what are the best types of exercise for arthritis sufferers? Exercises that improve range of motion. Incorporate these exercises daily in order to help increase your level of flexibility and maintain or regain normal movement of your joints. Include back exercises to help relieve pain and stiffness. Exercises that improve strength. Strong muscles support and protect your joints. Follow a strength-training program developed by your physical therapist or trainer and learn how to properly (and safely) perform these exercises. Cardiovascular exercises. Your cardiovascular health is important. While you may not be able to run, you can greatly benefit from walking, a stationary bicycle, swimming, or any activity that safely increases and maintains an elevated heart rate and breathing. Cardio training will also burn calories and help you maintain a healthy weight. Try to include exercises from all three of these training types. Regardless of the exercises you choose, focus on ones that do not cause you additional pain. As you exercise to increase the strength and flexibility in your joints, you will soon find particular ones that you enjoy. However, avoid doing the same workout over and over, with no variety. Doing this for extended periods will result in overtraining and cause injuries to your joints, especially your knees. Alternate your exercise program and include a wide range of low or no-impact exercises. Alternate training days with strength training exercises. But don’t skip the weight or resistance training as it strengthens those muscles and the supporting ligaments surrounding your joints and protects them from damage or injury and may delay additional deterioration. Strength training also increases bone density (thickness) and bone strength, and stronger bones and muscles support your joints and take pressure off of them. Your goal should be three or four session of twenty to thirty minutes each week. When your arthritis flares up you will be tempted to skip your workout, but keep in mind that arthritis sufferers who continually skip exercise are more likely to experience loss of muscle tone and flexibility, decreased joint motion and a progressive thinning and softening of bone and cartilage. While you can’t stop the aging process, there are simple steps to prevent unnecessary damage or wear to your joints and to reduce joint pain or swelling beyond increasing activity and exercise. Start by eating more joint friendly, anti-inflammatory foods. These include fruits like apricots, cantaloupe, kiwi and blueberries, and vegetables like bell peppers, broccoli, carrots, celery, and cauliflower. These foods have been shown to reduce inflammation and help remove the toxins that cause inflammation in your body and worsen your arthritis. Add omega-3 fatty acids from fish, flax seeds, walnuts and avocados, these foods and foods high in antioxidants like berries also have been found to decrease the inflammation and joint swelling associated with your arthritis. Encouraging the flow of blood and synovial fluid to your joints. Strengthening the supporting structures including muscles, tendons, and ligaments. Increasing the range of motion and flexibility of the affected joints. Increasing antioxidants that reduce swelling. Reducing the processed sugars, starches and toxins that promote inflammation. Don’t let your pain keep you from living a healthy, happy life. Take control of your arthritis today!